Det danske efterår med regn og kulde er et glimmerende tidspunkt til at tage til de varme lande. Planlægger du en eksotisk ferie i år og kan godt lide at gå eller løbe nøgen i skoven, hvorfor ikke prøve Thailand – og et nøgenløb i junglen? I dagene 23-24. oktober er der Naked Jungle Run i Thailand, arrangeret af Naturist Association Thailand. Distancer lyder på 2,5 km og 5 km, men er der interesse for længere løb, kan det blive til 10 km. Er kondien ikke i top til et løb, kan der blive tale om den kortere gåtur i junglen – en uforglemmelig oplevelse i smukke omgivelser. Selve stedet vil ikke blive offentliggjort til andre end selve deltagere, så der ikke er nogen frygt for paparazzis. Naturist Association Thailand will arrange a naked run in the jungle in October 2016. The run will be either 2.5 km or 5 km - or if there is enough demand even extended to 10 km. But the short run could also simply be a walk along the jungle track to the finishing line. The run will take place around the 23-24 October 2016 - the long weekend of the Chulalongkorn Day and will follow the format of the popular "mini-half marathon" that are currently very popular in and around Bangkok. The location of the run will be communicated only to the participants themselves in order to avoid paparazzi photographers. The route is a forest road in a beautiful, natural forest area some three to four hours drive out of Bangkok. Participants are urged to join the accommodation for the night before to be in place for the run. Medals will be awarded after the race at a place to be determined. The race is for members only, who will be invited individually. How does a person register for this run? Chan Resort in Pattaya is the only naturist resort in Thailand which allows guests to fully enjoy the natural surroundings of the area – without wearing clothes. Video by Jetjaras Na Ranong and Phannarai Sae-Loo. Vor herre bevar mig vel.. skal det vaere journalistic, ja ja enhver sin smag. Når de nu løber nøgne rundt på stranden bryder de den Thailandske lovgivning? Det er i offentligt rum. It is from a beach trip on Sunday 13 September where Members of Naturist Association Thailand went to "their" regular beach. Initially there were 14 naturists signed up before the cancellations started trickling in. But when we met up at the beach strip next to Bali Hai pier we were down to a core group of eight members, but we had a great day nevertheless. The lovely garden of Barefeet Naturist Resort, Bangkok with the solar powered pool heating system. Det ser da dejlig og fredeligt ud - godt afskaermet for nysgerrige blikke og der kan de lidt halvgamle og maaske overvaegtige falanger da gaa i fred og magelig ro istedet for at loebe rundt i en skov fyldt med alverdens kryb.. 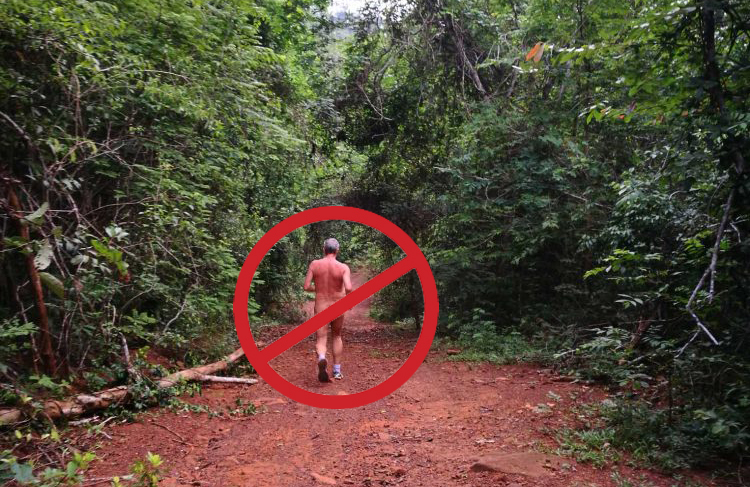 The claimed first-ever Naked Jungle Run event planned in Wang Nam Khieo district, Nakhon Ratchasima, on Oct 23 was cancelled due to "mixed reaction in social media", the organiser said on Thursday.